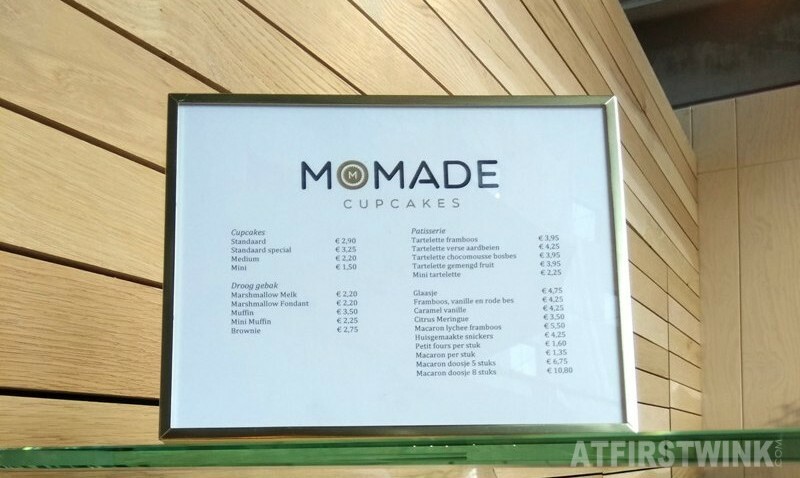 Momade cupcakes (Shop 41 in the Markthal) is from Belgium and I have never heard of it before. 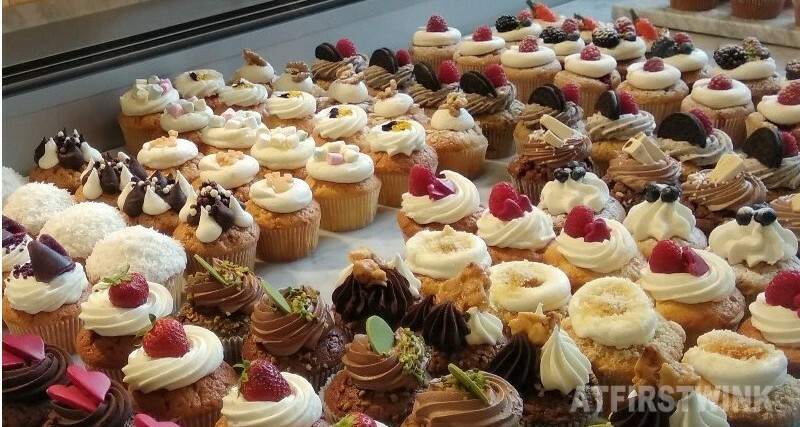 But after seeing their beautiful shop, I am really curious about their cupcakes and other pastries. I think it is for safety reasons that they have this metal case, in which you can pay by inserting cash in it. It is the first time that I saw a shop doing this. 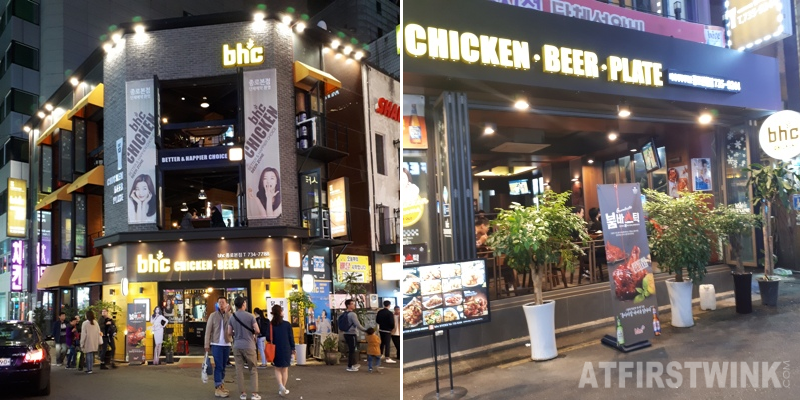 You can also pay by pin-card. 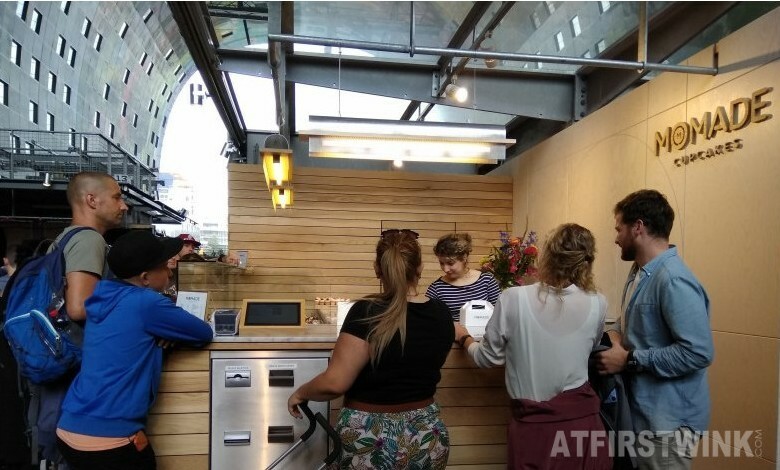 It is a really good idea, as you won't have to put your shop employee under the risk of being robbed and you don't need to monitor the staff, so she can just be there on her own. 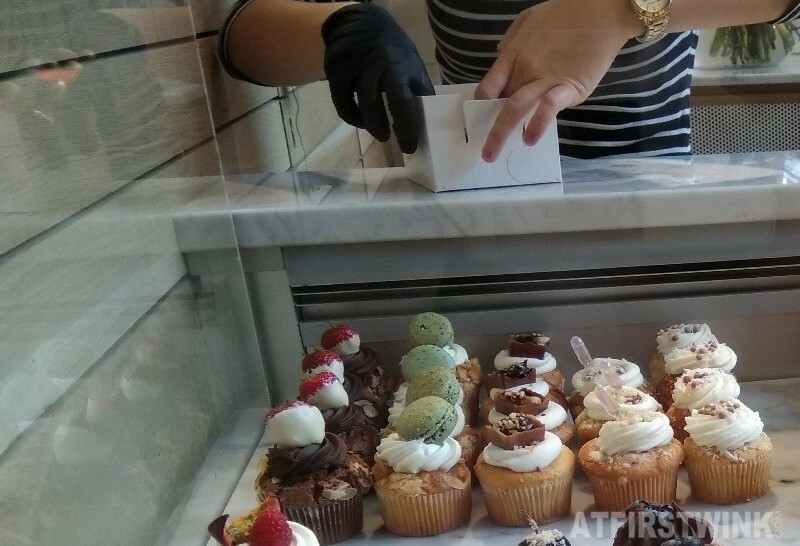 Hygiene wise, the shop employee is wearing a glove on her right hand with which she holds the cupcakes and she uses her uncovered left hand to fold the cupcake boxes. It would have looked even better, if she was wearing a hat to cover her hair. 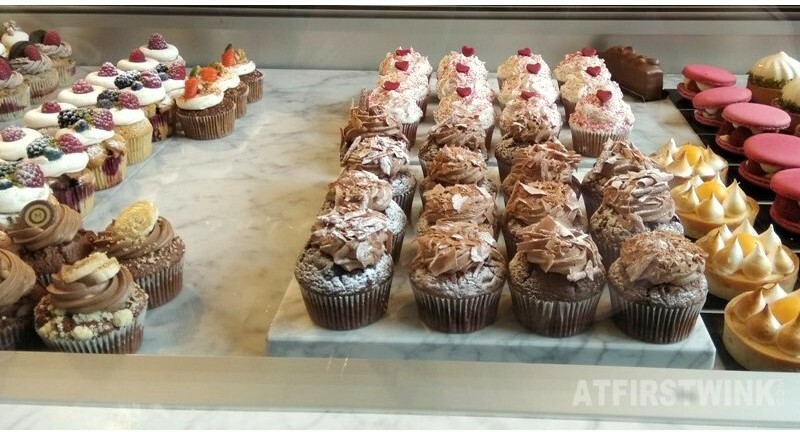 I really love the marble counter and the cupcakes just look amazingly beautiful. However, I wish there were some name cards telling me what kind of flavors they have. But luckily, they have a very good website with pictures and descriptions. 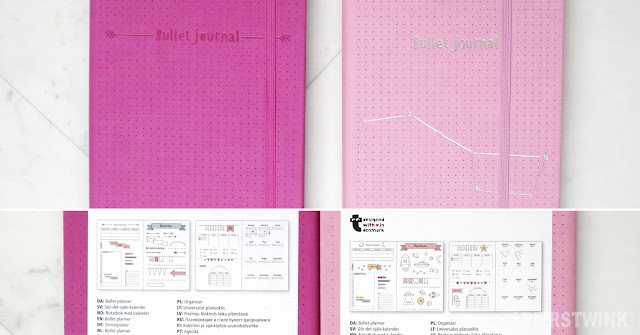 However not everything is on there, such as the cupcakes above with the pink mini syringe. Of course, there are some that you can almost guess, just by looking at them. The cupcakes with pink mini hearts underneath are the red velvet cupcakes and the ones with mini carrots on top are the carrot cake cupcakes. 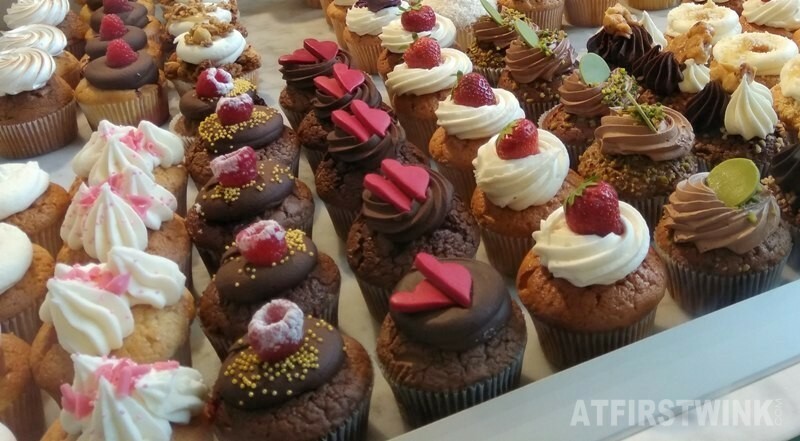 But you wouldn't know that the chocolate cupcakes in front of the red velvet cupcakes consists of 99% chocolate (chocolate cupcake, filled with chocolate ganache, topped with chocolate crème au beurre and chocolate flakes). 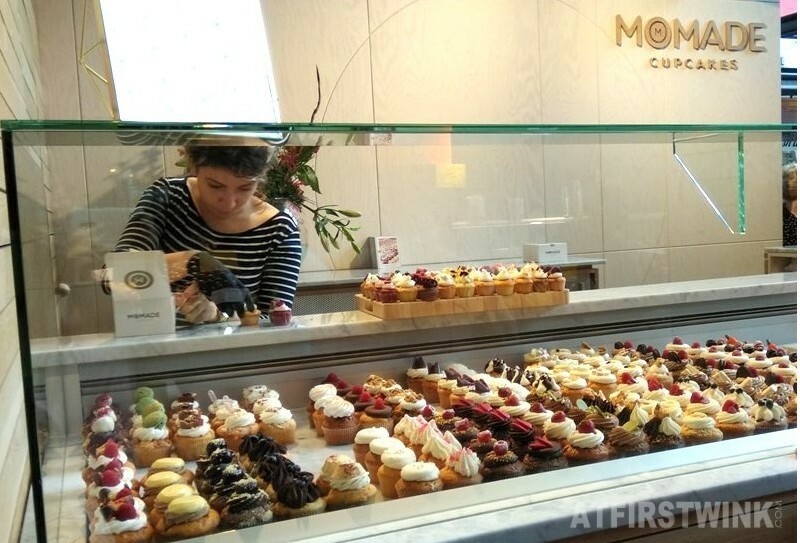 Besides cupcakes, Momade cupcakes shop also has macarons, homemade Snickers, dessert shot glasses, and tarts. 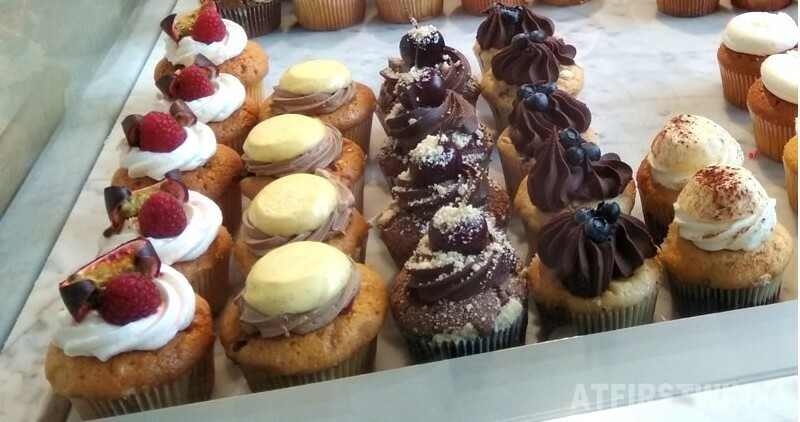 Underneath, you can find the price list of Momade cupcakes. 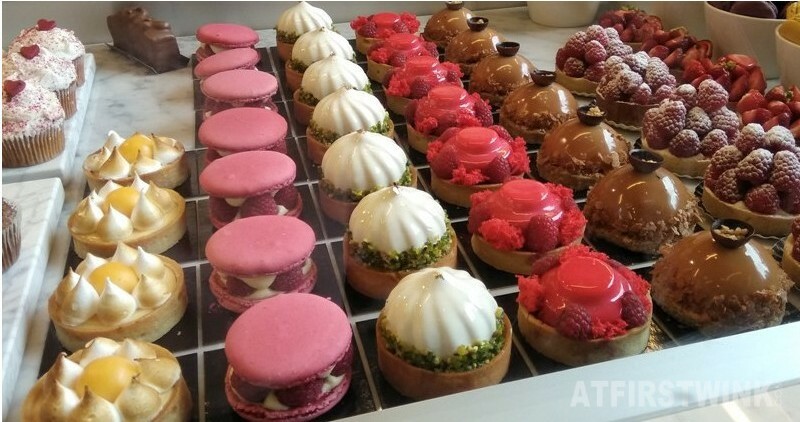 The prices are a bit on the high side, as a cupcake costs €2.90 (medium size €2.20 and mini size €1.50), a tarte about €4 (mini tart €2.25), and the giant macaron filled with lychee cream and whole raspberries costs €5.50. 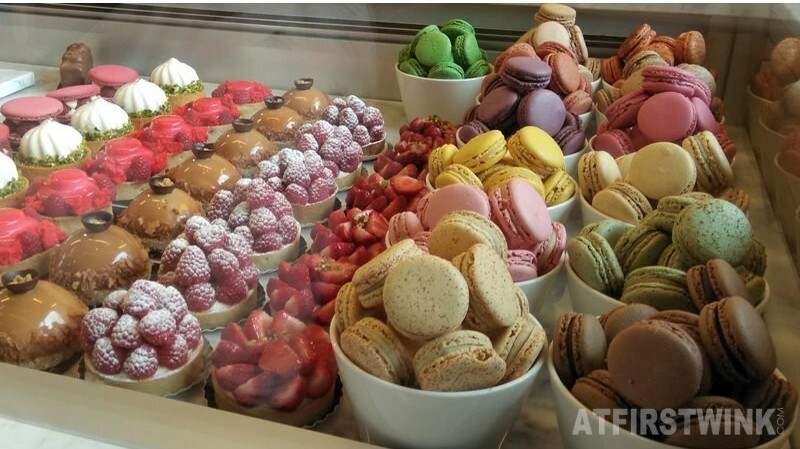 Petit fours are €1.60 per piece and macarons are €1.35 per piece. You can also buy a box of 5 macarons for €6.75 and a box of 8 macarons for €10.80. 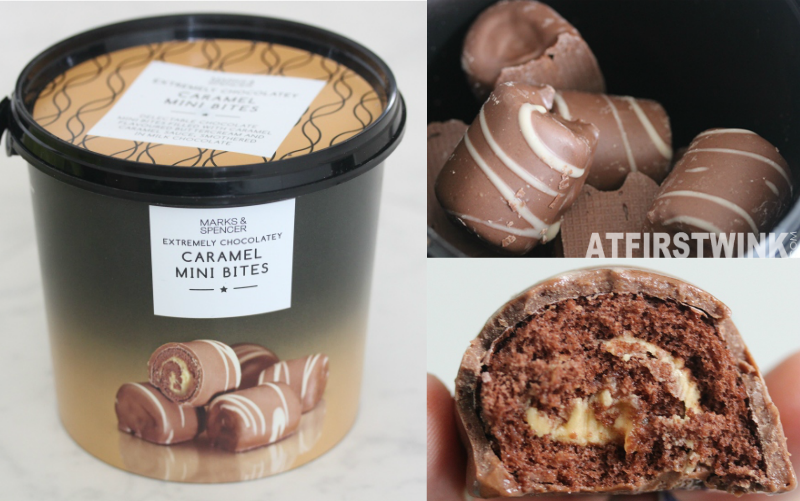 When you see how detailed and tasty these cupcakes, tarts, macarons and other pastry are, I am sure you will forget about the price. Some noteworthy ones: the chocolate pistachio cupcakes with round piece of green chocolate above and the cupcakes with the burned dot of whip cream in the picture underneath are cappuccino flavored! The purple triangular, cones on top of several cupcakes underneath are cuberdons (Belgian jelly candies with raspberry flavor that have a hard crust and an almost liquid jelly filling. 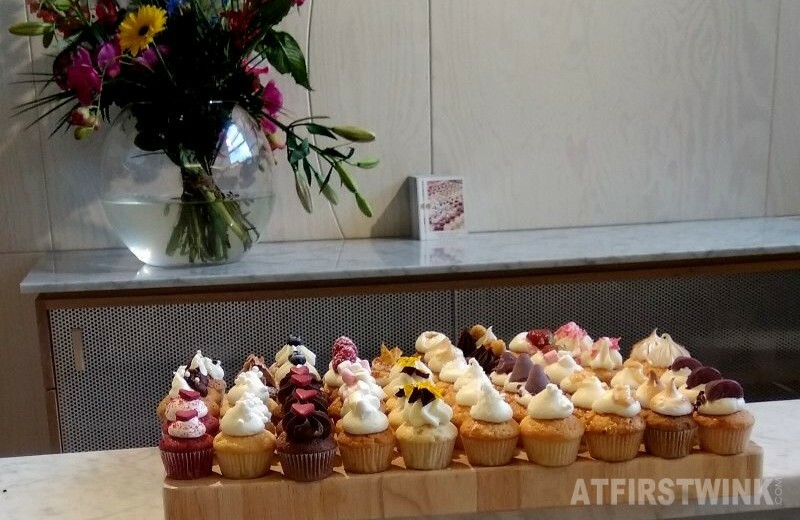 Above, you can find raspberry-passion fruit cupcakes and next to that, a creme brulee-cherry cupcake (Madagascar bourbon vanilla cupcake with a cherry filling, a crème au beurre topping and a soft, and a mini pudding shaped creme brulee on top). Underneath, there are cupcakes with pink chocolate shavings and colorful sprinkles, which are rose blossom water cupcakes. Never had that before! 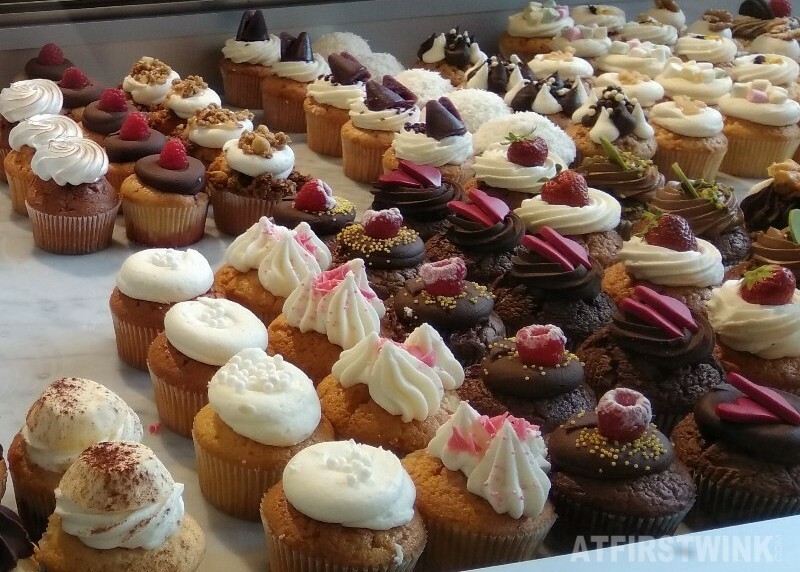 If you want to try more than one flavor, you can also just get a bunch of mini cupcakes (€1.50 per piece) instead of one large (€2.90). They look just as good as the larger ones.